Spain is a country widely revered for its refined culinary culture. The Spanish people put a great emphasis on eating, making sure to take a nap after the midday meal and pulling out all the stops for late-night family dinners. One delicious edible that's always present at the table for meals in Spain is bread, and this ubiquitous tradition has trickled down to some of Spain's former colonies in some surprising ways. With this guide, learn more about Spanish bread, it's variations, and how to make your own. The term "Spanish bread" can refer to a wide variety of different doughy morsels. While most Spaniards would attest that there is no such thing as "Spanish bread", they would instantly admit that bread is served with every meal in Spain. Native Spaniards simply think of this dish as "bread", and have no reason to view it from an international perspective. There are many varieties, including pan basico, pan rustico, and pan de horno. And that's not to mention all the sweetbreads and types of tortillas also concocted by Spanish chefs. The people of the Philipines, which used to be a Spanish colony, have their own version of Spanish bread that's quite different from the traditional breads you'll find at panaderias in Spain. In reality, Spanish bread can be many different things, and people from different parts of the world might be unable to agree on an exact definition. One thing is for sure, however: it is delicious in all of its forms and no chef has truly mastered the culinary arts who hasn't tried to make some variation at least once. The people of Spain have been eating bread for hundreds, if not thousands, of years. Bread is a food eaten daily by most Spaniards and has remained a culinary staple throughout multiple border fluctuations and invasions. From the basest members of the peasantry to the most elevated ranks of royalty, Spaniards were defined by their consumption of bread all throughout the middle ages and beyond. That's not to say that bread wasn't a source of some consternation to the Spaniards of centuries past. Being such a common dish, bread was in constant demand. However, the people of Spain were so poor for much of the middle ages that oftentimes the average person couldn't afford bread. In his book "Six Thousand Years of Bread: Its Holy and Unholy History", H. E. Jacob reports that this economic situation led rise to the following disturbing saying becoming common among the Spanish peasant folk: "When the poor man weeps, the baker laughs." As Spain became a major colonial empire during the Renaissance period, the Spanish conquistadors brought their culinary traditions with them around the world. Native inhabitants of Latin America, the Carribean, and the Philipines became acquainted with types of food that they had never tasted before. Though the Spanish conquest was distinctly unpleasant for the indigenous populations of the regions that became colonies of Spain, the people of these areas ended up adopting many aspects of Spanish culture, including the language, customs, and food of their conquerors. The Filipinos in particular incorporated a wide swath of Spanish dishes into their cuisine, to the extent that these days the term "Spanish bread" is more commonly associated with the Filipino dish of that name than it is with the various traditional forms of bread baked in Spain. People in the Philipines bake Spanish bread for varying occasions and it is a common snack to be enjoyed at midday with coffee or tea. The form of the bread baked in the Philipines, however, bears little resemblance to any of the types of bread baked in Spain, leading to some confusion as to why these morsels are even called Spanish bread in the first place. Misleadingly-named or not, this bread is so beloved by the Filipinos that it is in no danger of going anywhere. But the other types of bread made in Spain that go by the same name shouldn't be overlooked just because the Filipino version is incredibly popular. 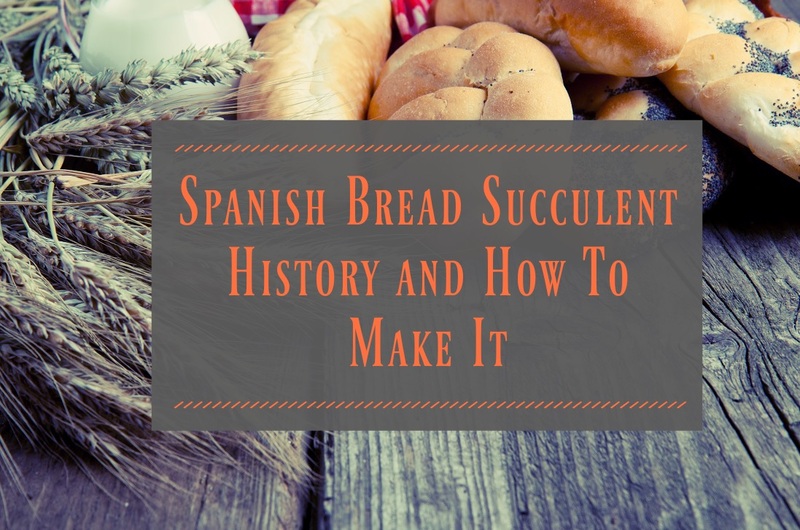 In the following sections, we provide background information and recipe instructions for two of the dishes most commonly known as "Spanish bread"
Pan rustico is a traditional type of bread baked in Spain. Not to be confused with pan basico, pan rustico has its roots in ancient Spain and hasn't changed much (if at all) over the intervening centuries. You can still find the bread baking in panaderias all across Spain, and the local culture reveres pan rustico as the most authentic type of the Spanish bread. We've chosen a straightforward recipe by Lisa & Tony Sierra to demonstrate how easy it is to make this delicious taste of Spanish culture. Mix together the flour and the salt in a medium mixing bowl. Pour the dry yeast into a ceramic cup that has been warmed. Heat the water on the stove with a pan until it is very warm. Avoid making the water too hot. Pour about 1/3 (4 ounces) of the water into the ceramic cup and mix it with the yeast until the yeast has completely dissolved. Pour the dissolved yeast into a large mixing bowl and add most of the remaining water to the bowl as well. Leave about 1/2 cup of water in the pan. Slowly add the flour and salt mixture into the large mixing bowl, stirring with a wooden spoon as you go to make sure that all of the water is absorbed. 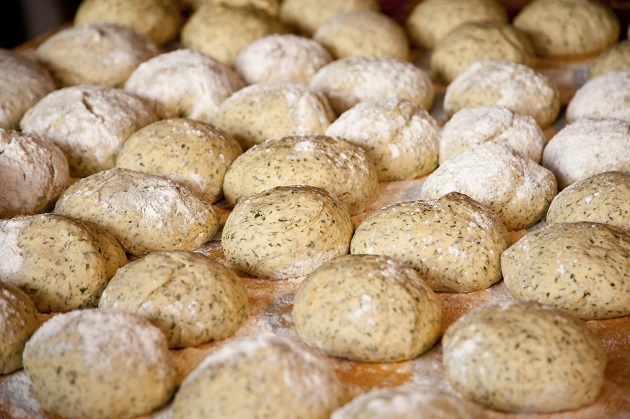 When you're done adding the flour and stirring, the resulting dough should form into a smooth-textured ball. Coat a large mixing bowl with olive oil and transfer the dough into this bowl. Cover the bowl with a damp cloth. The dough is usually then left to rise on a warm countertop, but if your kitchen is cold, place the bowl in the oven at 150 degrees Fahrenheit with the oven door open. Cover a cutting board with flour and transfer the dough to the cutting board. Knead the dough thoroughly with your hands. Divide the dough into three oblong sections. Place the dough on an oven sheet and preheat the oven to 375 degrees. Cut slits in the tops of the loaves and place them in the oven. Bake the dough for about 10 minutes. Remove the loaves from the oven and coat the tops with the beaten egg. Return the dough to the oven and continue baking for about 15 minutes. Allow the bread to cool for around 15 minutes before serving. Nowadays, this bread is mainly known as the lunchtime delicacy served with delight in the Philipines. More of a treat than a meal, this bread made in the Philipines calls for a sugary filling as well as a bready exterior. There are dozens of ways to make it, but we chose a recipe by Instructables user makemyclay because it looked so downright delicious. Mix the yeast, teaspoon of sugar, and warm water in a cup. Let the yeast proof for about five minutes. Mix the flour, salt, and sugar in a mixing bowl until thoroughly combined. Form an indentation in the center of the mixture with your hands and add the milk, butter, yeast, and eggs. Stir with a wooden spoon until these ingredients are incorporated and a ball of dough has formed. Transfer the dough onto a cutting board and knead the dough for about 10 minutes until it is smooth. Lightly grease a bowl with vegetable oil and transfer the dough into the bowl. Cover the dough with cling wrap and place a kitchen towel on top. Let the dough rise for about 3 hours. Divide the dough into 16 pieces and spread butter on the flattened pieces. Sprinkle bread crumbs and brown sugar on the pieces and wrap them up. Coat the dough pieces with bread crumbs. After allowing the dough to rest for 30 minutes, place it in an oven preheated to 160 degrees Celsius for 12 to 15 minutes. Allow the bread to cool for about 20 minutes before enjoying. There's no right or wrong way to make this delicious bread. It all depends on your personal preferences and what Spanish bread is to you. If you want to try an authentic taste of Spanish cooking, you might want to make a loaf of pan rustico. But if you're in the market for a casual sweet treat, Filipino Spanish bread might be perfect. Feel free to experiment and come up with your own unique and tasty bread recipe.